Lisa and Cindy live in the charming, environmentally conscious (and design conscious) community of Serenbe, located in the Chattahoochee Hill Country, just 32 miles southwest of Atlanta. They describe their home style as a mix of eclectic, modern and rustic. Growing up in Ohio, they both have a fondness for the midwest, the farm life and furnishing with history and soul. With a wide and inviting front porch, (a prerequisite for all homes at Serenbe) their Shaker style farmhouse abode is a community focused home. This red bench and the colored metal containers were purchased at the Scott Antique Market in Atlanta. Although the bench has a southern feel, it's actually Asian. Set against the white backdrop of their home, the red bench combined with the colorful containers give the porch that pop both Lisa and Cindy were looking for. The beach cruiser was given to Lisa as a gift and the stylish basket bought from Relish Home + Interior Design. 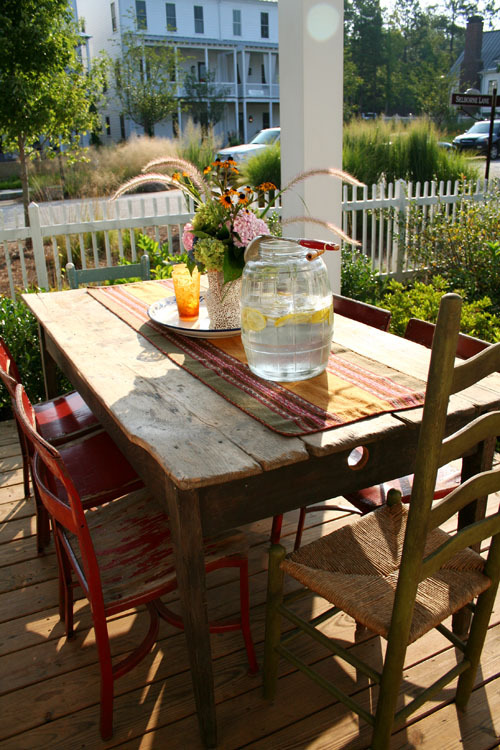 Repurposed chairs invite conversation on the back porch. The small chair hung on the wall was found at a flea market in Georgia but made in Lisa and Cindy's home state of Ohio. 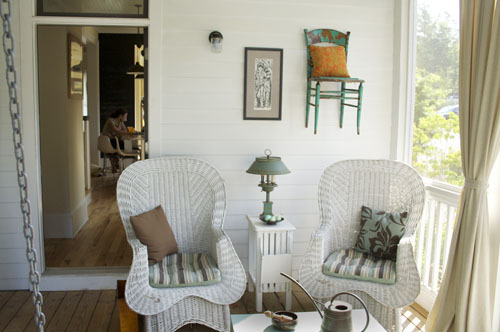 In the Shaker community, it was common to see extra chairs placed on the wall and given that their Georgia home is in the Shaker style, it complements their space brilliantly. So lovely, thank you for sharing Lisa and Cindy. I think we'll need to do a second blog post about inside your home...this sneak peak just begs for more!